Debris – noun. Scattered fragments, usually of something wrecked or destroyed. This body of work explores the “debris” associated with the gendered performance of the beauty ritual. By combining large scale, abstract photos with the physical objects they represent; this work seeks to examine and critique the dichotomy of natural and altered bodies and the balance of desire and repulsion. 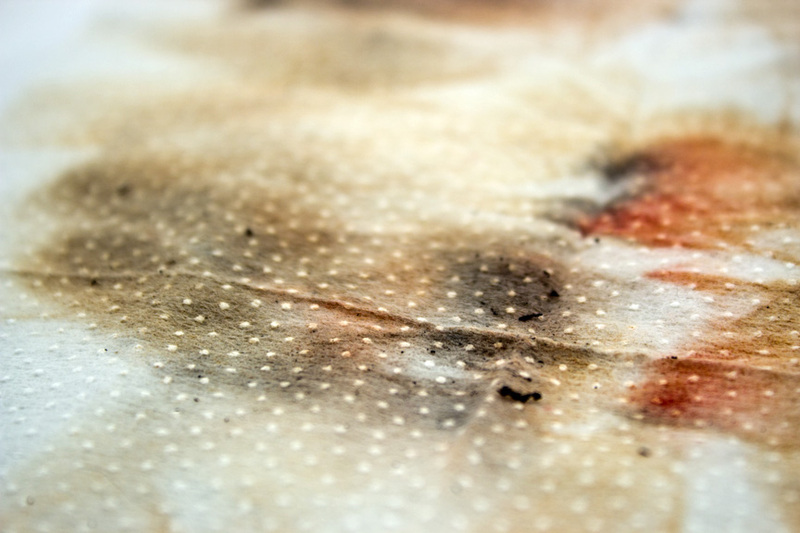 Large-scale images of make-up removal wipes, foundation sponges, bikini wax strips, and clumps of hair explore each of these discarded items in an abstract closeness. These extremely close up photographs investigate these subjects at an intimate level. This work uses the visual language of abstract body landscapes to unpack and critique the way those images are often achieved. In framing these bits of bodily trash with a critical lens, the images transform the debris from abject objects to forms worthy of objectification.